Transfer to the airport for your flight to Baltra, a small island (27 square kilometres) off the north coast of Santa Cruz. You will be met at the airport and transferred to the jetty where a small boat will be waiting, amongst pelicans and noddies, to transfer you to your yacht. First stop will be to Las Bachas, a whitesand beach that is a major egg-laying site for sea turtles. Las Bachas refers to the indentations left in the sand by egg-laying turtles and departing hatchlings. Flamingos are common in the lagoon beyond the bay, and marine iguanas are often spotted on the shoreline. Today, you will disembark at Bartolome Island for a hike to the summit and a spectacular panoramic view. 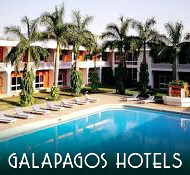 Later there will be a chance to snorkel with the Galapagos Penguins. Landing at Perto Egas, you will notice the landscape surrounding is of harsh terrain, covered primarily by a sparse forest of Palo Santo trees. The shoreline south of Puerto Egas has been eroded, molded, and polished by the sea into coves and elaborately patterned rocky beaches. We will walk along the coastal trail looking for octopus, starfish and other sea life caught in the tide pools. You may be privileged to spot whales or dolphins cruising offshore or a feeding frenzy of hundreds of boobies or pelicans diving on schools of fish. 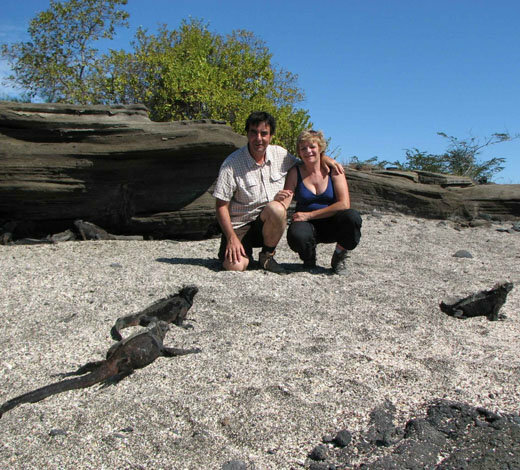 At low tide you can catch a glimpse of marine iguanas as they feed on exposed green algae. Birds that we should observe at Puerto Egas include great blue herons, lava herons, oystercatchers and yellow-crowned night herons. At the end of the trail is a magnificent lava-walled grotto carved out of the rugged shoreline. In its shady crevices is often found a small group of fur seals. Though once on the verge of extinction, you can observe these seals cavorting in the crystal clear water. In the morning a trip to the beach of the small volcanic island of Rabida. A small path will lead to a small lagoon populated with flamingos. 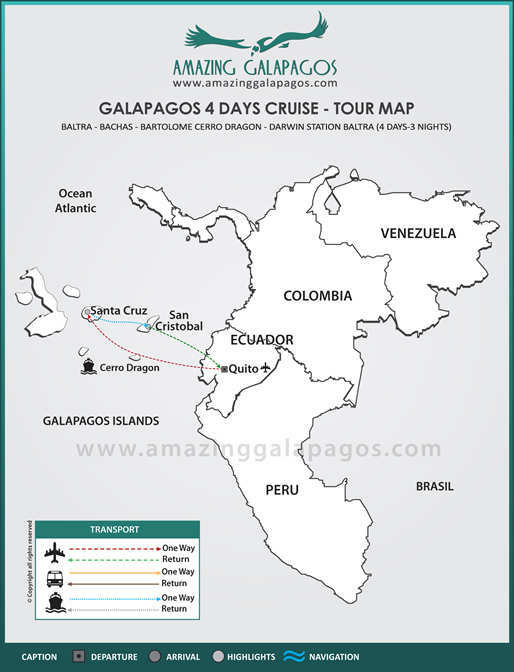 In the afternoon we will disembark at the relatively new visitor site called Cerro Dragon (“Dragon Hill”) on the north side of Santa Cruz Island. 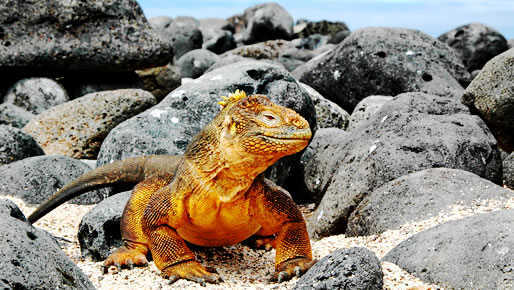 Walking quietly along the footpath we should see some of the land iguanas that are endemic to this island. Once part of the Darwin Station's breeding program, these repatriated iguanas display orange-yellow skin and large spines along their backs. The path skirts a salt water lagoon and we should be treated to the sight of startlingly pink flamingos feeding in the shallows. Other birds often found here are Darwin finches and yellow warblers. The terminus of our easy hiking will be the top of Dragon Hill for a majestic view. In the late afternoon we return to the vessel. 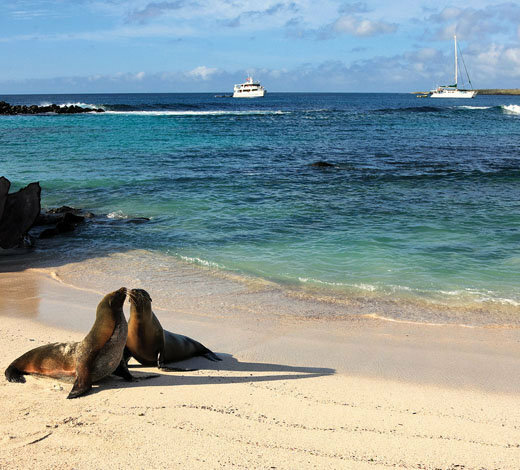 The last day of your cruise with a visit to the Charles Darwin Research Station. The station is also a tortoise breeding centre, where tortoises of different species are prepared for reintroduction to their natural habitats. The most famous inhabitant is probably Lonesome George, the only survivor of this specific turtle species. Return to the airport for your return flight to Quito.